As you know, I grew up in Milan, in Northern Italy. Milan is in a fantastic area, just in the middle of Europe, which made travelling very easy even in the pre-low-flight-era. My parents have always loved Paris, so we would go there at least once a year, usually before Christmas. So, I have had my share of Yule Logs (or as they are locally known, Bûches de Noël). I also made it once, when I was a teenager. However, I had not eaten it in a very long time, and this year I decided to make it at home. Well, it is much easier than you think. There are hundreds of versions around, many of which use buttercream… but I am a huge chocolate lover, so I thought a chocolate ganache would work better. And it did! 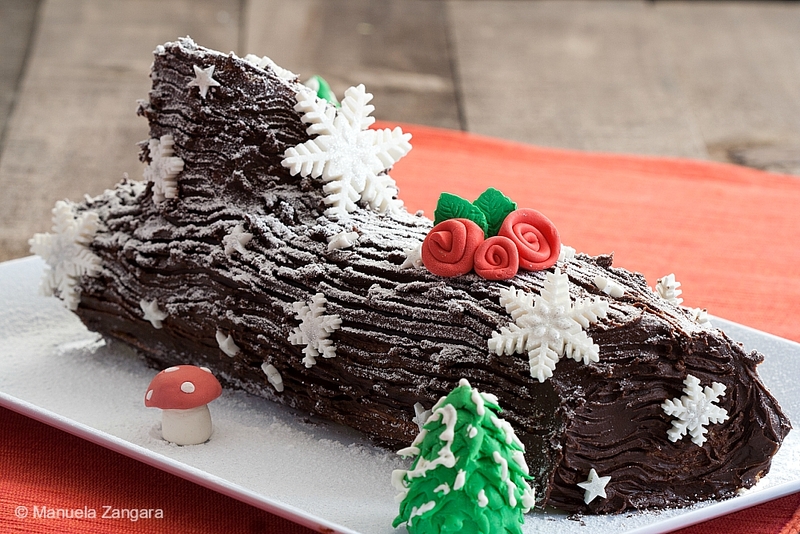 This easy Chocolate Yule Log was a super hit! I filled the Genoise cake with chocolate ganache and then I also used it to cover the log. To decorate it, I used icing sugar and fondant, but you can really use anything you like. It makes for a fantastic Christmas dessert! Enjoy and Merry Christmas everyone! 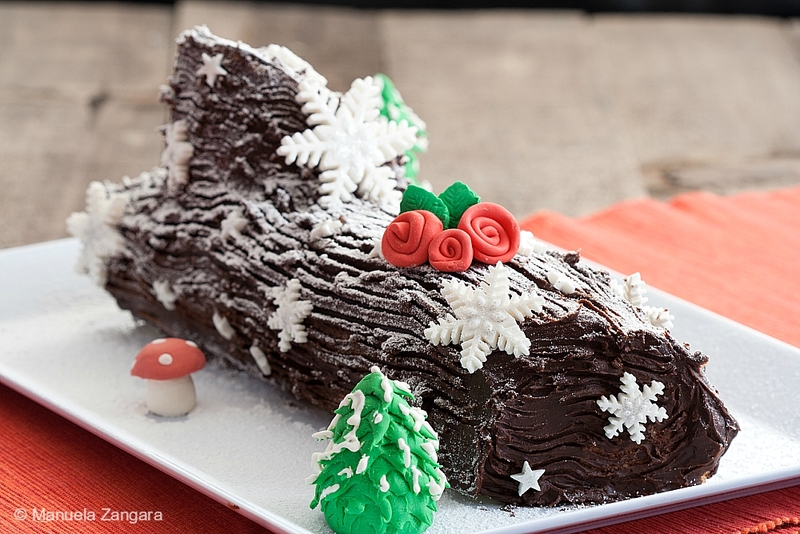 A tutorial on how to make a beautiful Chocolate Yule Log. Filled and covered with a delicious chocolate ganache, this Yule Log is much easier to make than it seems, and it makes for a great Christmas dessert! Heat the cream in a saucepan until almost boiling. Put the fire off and add the chocolate to it. Leave it, without mixing, for 5 to 10 minutes. Add the butter and stir well until melted and the ganache is smooth. Then put it in the fridge until it thickens. In a medium bowl, sift together the flour and almond meal. Keep aside. Whisk together the egg yolks and the icing sugar until white and fluffy. In a separate bowl, whip the egg whites until soft peaks. Gently fold the whipped egg whites into the yolk mixture. Make sure not to deflate the mixture. Gently fold in the sifted flour and almond meal. Again, make sure not to deflate the mixture. Pour the batter into an oven tray lined with baking paper. Make sure to have a thin layer (about 5mm – a little less than ¼ inch) of evenly distributed batter. Bake in a pre-heated oven at 180°C – 355°F for 10 minutes. When ready, roll it on itself while still warm. This will help you not to break it when you have to roll it later. Let it cook down completely rolled on itself. Then unroll it and spread it with some of the chocolate ganache. Roll it again on itself. Cut out a slice at a 45-degree angle. Using some chocolate ganache, attach the slice on the top of the cake, to make it look like a cut-out branch. Use the remaining chocolate ganache to cover the whole yule log. 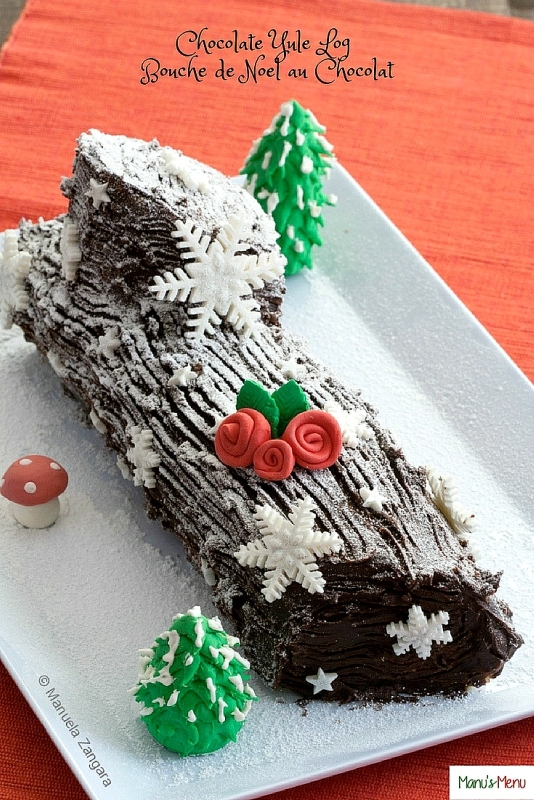 Use a fork to trace lines on it and decorate the yule log with icing sugar. I also made some snowflakes, stars and other decorations using fondant and edible silver glitter.